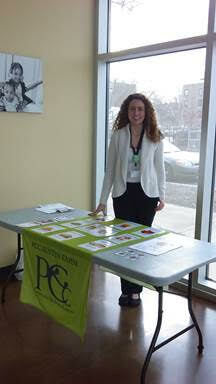 PCC Community Wellness Center (PCC) is celebrating National Nutrition Month at its Austin-based health center. On March 13, 20, 27 and 28, dietetic interns from Dominican University will coordinate activities to provide patients and staff with practical tips for eating healthier. Participants will have the opportunity to test their nutrition knowledge, taste some nutritious snacks, play games, win prizes and have their questions answered by dietitians. Each year in March, the Academy of Nutrition and Dietetics sponsors National Nutrition Month® to emphasize the importance of choosing healthy foods and engaging in physical activity consistently. This year’s theme is “Put Your Best Fork Forward,” a reminder that every bite matters. Adjusting food choices gradually – one forkful at a time – facilitates healthier, lasting change. For PCC, celebrating nutrition month is a natural extension of the clinic’s mission to improve health outcomes for the medically underserved community through the provision of quality, affordable and accessible primary health care and support services. The activities will take place, starting this Monday, from 10 a.m. to 1 p.m. in the second floor conference area of PCC Austin Family Health Center, 5425 W. Lake St.
PCC encourages anyone interested in learning more about nutrition month activities to contact Lucy Flores, community outreach health education manager, at (773) 413-1240. In celebration of National Health Center week, Austin residents are invited from 2 to 4 p.m. Aug. 14 at 330 N. Lotus Ave. There will be fresh produce for sale and hands-on gardening activities, and 37th Ward Ald. Emma Mitts will be honored.